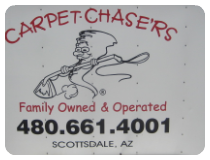 Carpet Chase'rs is a Family Owned and Operated Carpet & Tile Cleaning Company located in Northeast Scottsdale. We were established in 1996 and have been serving the entire East Valley ever since. Providing exceptional service while being very reliable are staples of what truly make us unique. We have been providing Reliable and Exceptional service since 1996.